Aquatic Explorations is a 2-hour boat Mass Audubon Cruise cruise aboard our very own Sea Swan. Discover creatures that actually live in Cape Cod waters! We’ll use and otter trawl net, fish pots and plankton tow to bring everything from microscopic marine life to glowing comb jellies to small sharks onboard for close-up observation. It’s a marine science classroom for kids! Cruise out into Hyannis Harbor, pass ferries and pleasure craft en route to your destination in the inner harbor. 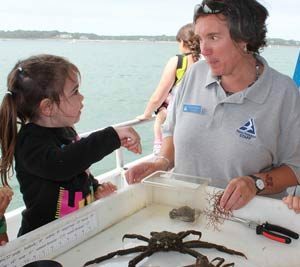 The crew pulls traps full of seaweed, spider crabs, small creatures and more just waiting to be discovered by the kids. The content of the traps is brought on board, and armful by armful, it is placed on two tables. Kids go to work sifting through the seaweed, finding all the creatures (no matter how tiny), and placing them in small plexi-glass tanks for easy viewing. They’ll likely find comb jellies, baby shrimp, spider crabs, hermit crabs and different types of seaweed. This family oriented cruise launches from Hyannis, and travels through Lewis Bay and near shore on Nantucket Sound.